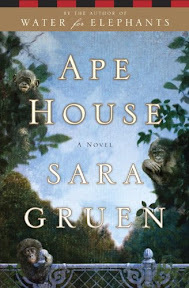 Ape House [Book Review] – my books. my life. John Thigpen, a reporter out of Philadelphia, is writing a story on a language lab where Isabel Duncan is teaching bonobos to communicate with people using American Sign Language. Shortly after John’s visit to the lab, the lab is bombed, the bonobos are “liberated,” and Isabel is injured in the explosion. The story follows the apes after they are sold, Isabel’s attempts to get them back, and John’s attempts to save his career and his marriage. I’m torn on what I thought about Ape House. Did I love it as a novel? Not really. Did I love the subject matter? Absolutely. See, I love chimpanzees (bonobos are technically chimpanzees though not what we commonly think of as chimpanzees). When asked what my dream job is, 7 out of 10 times, I’ll probably say that it would be teaching chimpanzees how to talk. Unfortunately, I don’t think I have the proper qualifications. So the parts of the story that focused on the bonobos and showed their incredible ability to communicate with humans were great. Seeing their amazing ability to understand human speech and react to it was simply fascinating. Gruen did a wonderful job developing the apes’ characters and personalities. But when it came to the humans, I thought the story fell a little flat. I didn’t really care much about John and Amanda’s relationship. I cared a little more about Isabel, but ultimately, when the story focused on people, I was a little bored. I read those sections just waiting to get back to the apes. I expected more from Gruen’s follow up to the beloved Water for Elephants. I really wanted to love this book. The subject matter and the author drew me to it. I think there are others out there that did love it, and I’d love to hear what everyone else thinks. Perhaps someone can convince me that I do love it afterall. This sounds like fun, and different to anything I’ve read before. It’s a bit disappointing that it wasn’t as great as you had hoped though. Okay, so that’s one ‘meh’ and one ‘hated it.’ Is it wrong that these responses are making me want to put down everything else and read it right away? I’m trying to stay away from reading too many reviews on this one. I don’t want to have high expectations and I don’t want to be discouraged from reading it. I loved Water for Elephants, and I will read this one for myself. I love the subject matter as well. Great post! I read it yesterday but didn’t have time to comment. I felt exactly the same about it, though I think I actually am in the “hated this book” category – my review is pretty full of rage. I still am going to read Water for Elephants and am wondering if this one was a fluke. Is that possible? The humans were really not interesting or sympathy-inducing for me, and I didn’t think a lot of what they did made sense or mattered. And there was this weird wind-up with a certain two people that never seemed to go anywhere, which I guess is fair – that kind of thing happens! Pingback: Sunday Salon 9.12.10 - my books. my life.